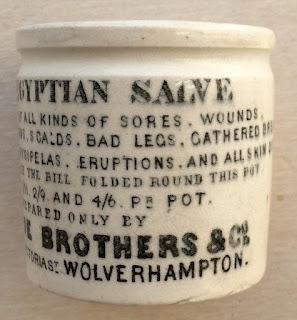 This page shows the 'Egyptian Salve' pots originating from the Wolverhampton area. 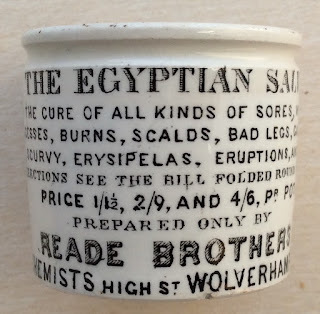 Several variations of the Egyptian Salve pots exist, some of which are rarely seen, particularly the larger size ones. 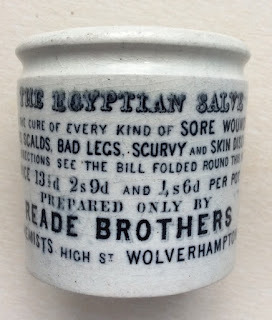 The small sizes are quite commonly found, save for the Reade Brothers, High Street pot with the price of 13½d. 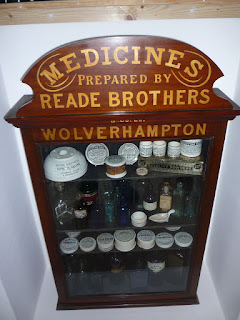 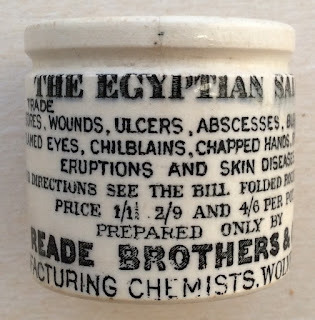 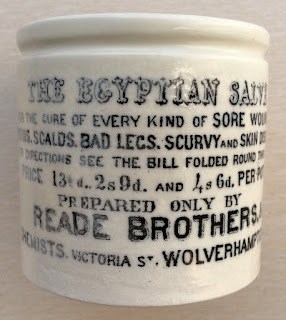 Reade Brothers, a chemist and druggist firm, first traded their Egyptian Salves from their High Street premises in Wolverhampton. 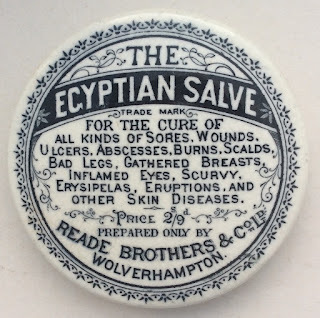 In 1877 the company moved to new premises in Victoria Street. 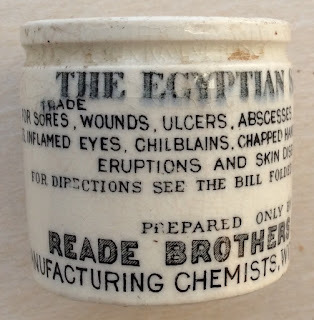 In 1892, a business directory recorded the fact that the company began trading under the name of Reade Brothers & Co. 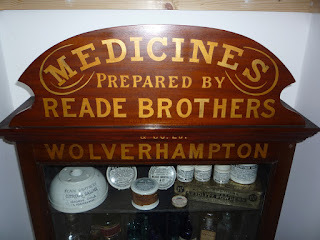 Furthermore, in 1896 a further name change was recorded in the Kelly's directory for the business, becoming Reade Brothers & Co Limited. 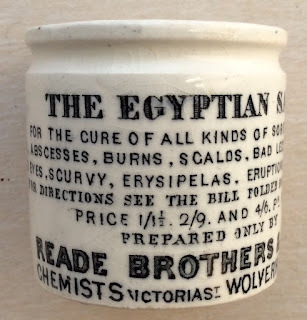 The first range of prices that appeared on the pots were 1/1½, 2/9 and 4/6. 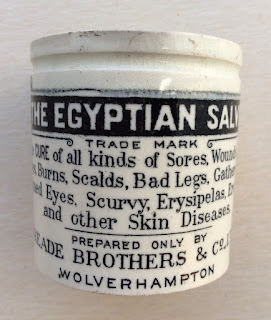 The large size variation covering the cure of Sore Wounds, Burns, Scalds, Bad legs, Scurvy and Skin Diseases without the dark band around the top, shows the first price level as 13½d. 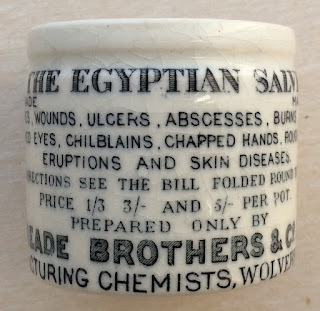 (actually the same price as 1/1½d) The variations with the dark band around the top do not show any prices at all. 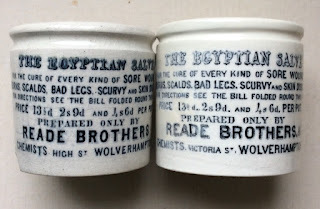 The pots bearing the name Reade Brothers & Co, Manufacturing Chemists, Wolverhampton show price increases to 1/3, 3/- and 5/-. 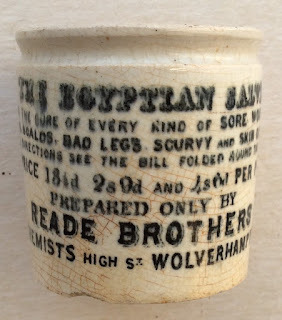 A new discovery in 2012 is a small size pot bearing the name Reade Brothers, Chemists, High St, Wolverhampton with the early style print, showing prices of 13½, 2/9 and 4/6. 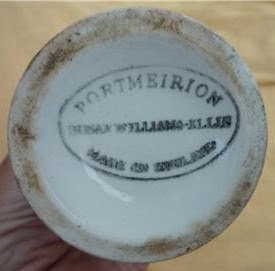 The pot is very similar in style to the large Victoria Street pot but has the earlier address. 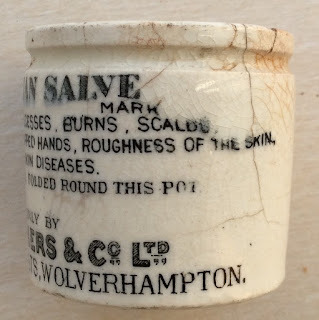 Pot lids can also be found in different sizes for the product so the higher priced products are found in lidded pots, not ointment pots as such. 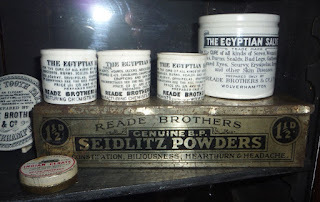 An article appears in BBR magazine no. 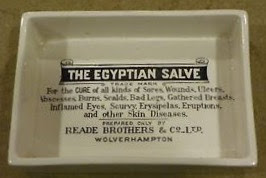 94 regarding the rare "High Street" variation. 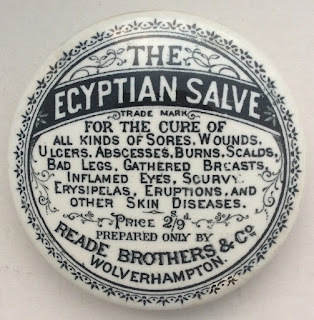 variation of the text also. 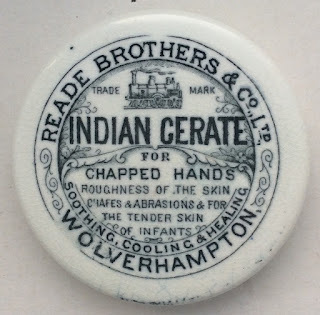 Indian Cerate for chapped hands. 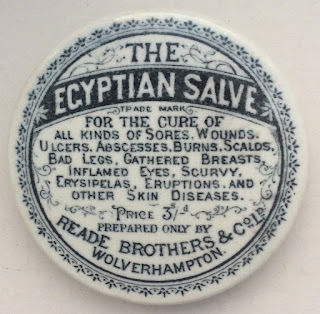 locomotive pictorial Trade Mark image. 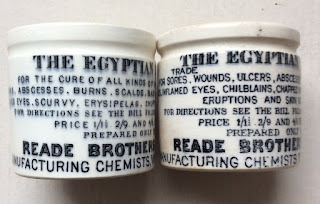 Below are some images from a collection dedicated to Reade Brothers. 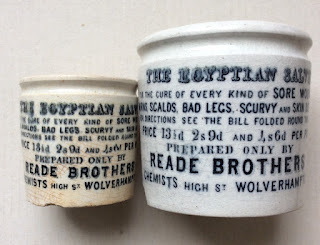 There are a series of 1970's or later items produced by the potter Portmeirion copying the original Advertising for Reade Brothers & Co Ltd.
Not produced to deceive I am sure but those that have an interest in Victorian collectibles should be aware they are NOT old ! 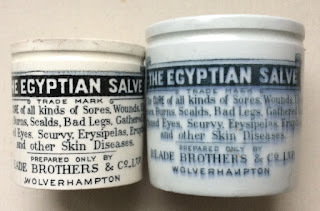 A couple of items are shown below. 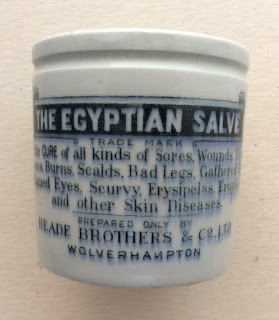 Further information regarding the history of the manufacturers can be found in the Historical Guide to Delftware and Victorian Ointment Pots book produced by Messrs. Houghton & Priestley, pages 66 to 69.